order now Our students at Citrus Grove Middle School gave their Guitars Over Guns experience the Hollywood treatment when they filmed, directed and starred in their very own documentary movie! The 30 students wanted to show the world a behind-the-scenes peek at their day-to-day experiences in our program at Citrus Grove, from the first day of the 2018-19 school year through the end of their first semester. 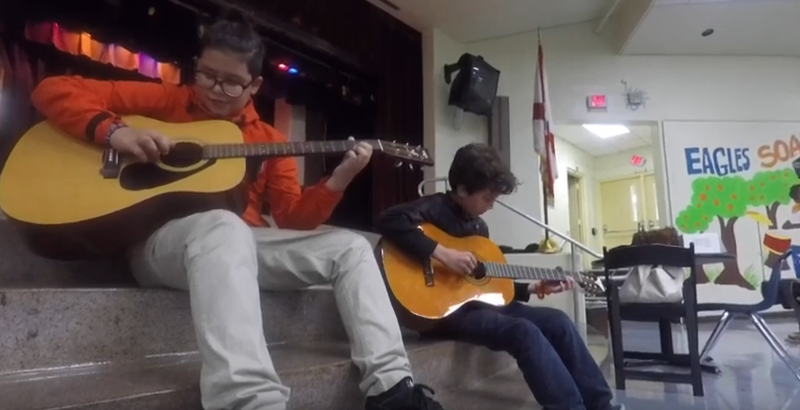 From interviews and vox pops, to snippets of live performances, to scenes of a fun birthday celebration and a very special music “karate belt” ceremony, the students captured the excitement, challenges and humor of life as a middle school musician. Shoutout to mentors Zander Ambrose, Kim Cameron, Alejandro Elizondo, Leo Mayorga and Russ Speigel for letting these kids’ creativity take them to Hollywood and back! Did somebody say Oscar buzz? Watch Citrus Grove: THE MOVIE – Parts I & II below!